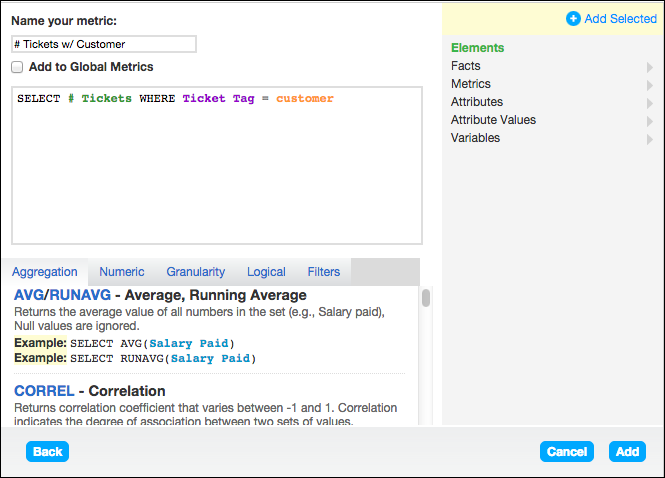 In this article, you will learn how to create a report that shows all tickets with a specific tag. Then, you will be able to break down the report to show all of the other tags associates with the tickets. For example, you have a tag called "customer" that you add to tickets for all of your most important customers. You also want to see what tags are associated with these customer tickets, because these tags may tell you of any common issues among your customers. To do this, we'll need to limit the report to only show the tickets with "customer" tag. Then, I can define the report to slice my customer tickets by tag. 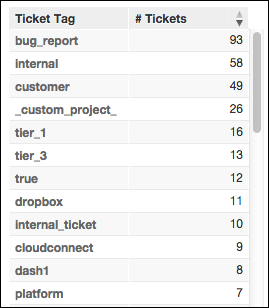 First, you'll need to create a metric to show all tickets with the tag "customer." To do this, we need to create a custom metric in the Advanced Metric Editor. Note that we will not need to include this metric directly in the report. Rather, we will use this metric as a report filter (numeric range filter), so that only tickets that have this tag will appear in the results. 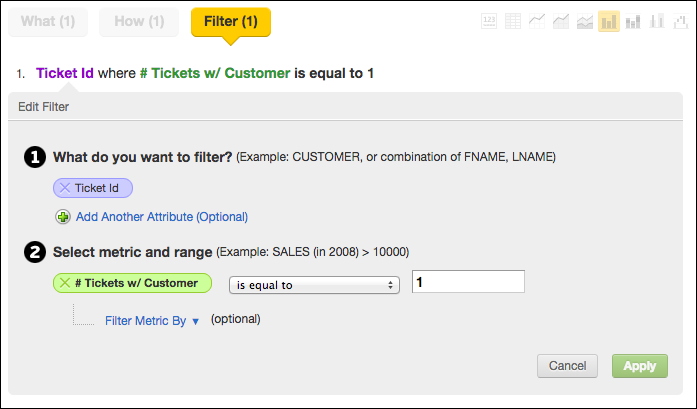 In the background, this filter matches up with tickets with your designated "customer" tag as defined in your metric. When the filter finds a ticket that matches the criteria, it will result in a "1." Tickets that do not match the filtered criteria will result in a "0." Therefore, you will need to filter for all Ticket IDs that result in a "1" when compared with your tag metric -- this is how you will know that all of the tickets shown in the report have the "customer" tag. For this report, you will need to use a Numeric Range filter, which I will define below. Here is our final report where I can see all "Customer" tagged tickets, and all the other tags that those tickets have. In the report below, I have ordered this in descending order to show the top tags that "Customer" tickets have. Hi, i would like to add a full resolution time in your example, but insights does not permit use the metric when i used the ticket tag like attribute (how). Oh yeah, that's exactly what I needed! Thank you! My custom metric pictured below is not appearing as an option when I try to set the numeric range filter. Any ideas? Your screenshot isn't showing up for some reason...would you be able to edit your comment re-add it? If you could add additional screenshots showing where the metric should be showing up on your list but isn't, that would be helpful, too!